The two main intersections at Dhaka’s Gulshan 1 and 2 contain a flurry of commerce. Whilst the surrounding retail stores sell luxury goods and expensive clothes, those commuting through the two “circles” are unlikely to escape a sensory assault from beggars and street hawkers, who are heavily concentrated in the affluent area. As many as five at a time may approach a vehicle, each relentlessly tapping on the window or CNG grates until the traffic moves on or the passenger gives in – perhaps by buying a bag of popcorn. The experience can be both unpleasant and intimidating, as the demands are often brazen. Although a newcomer may feel distressed when confronted by such poverty, many of us – including myself – have become densensitised in order to cope. Thus it was something of a surprise when, last week, whilst navigating the Gulshan 2 intersection by foot, a plucky little street kid called Sohel attached himself to my arm and utterly charmed me. A few days later I went back to find him and spent a couple of hours in a café listening to his story. It’s not atypical of the lives of Dhaka’s 90,000 street kids, nor the estimated 150 million throughout the world, but the dignity and discipline with which Sohel conducts himself is a worthy reminder of the resilience of the human spirit. 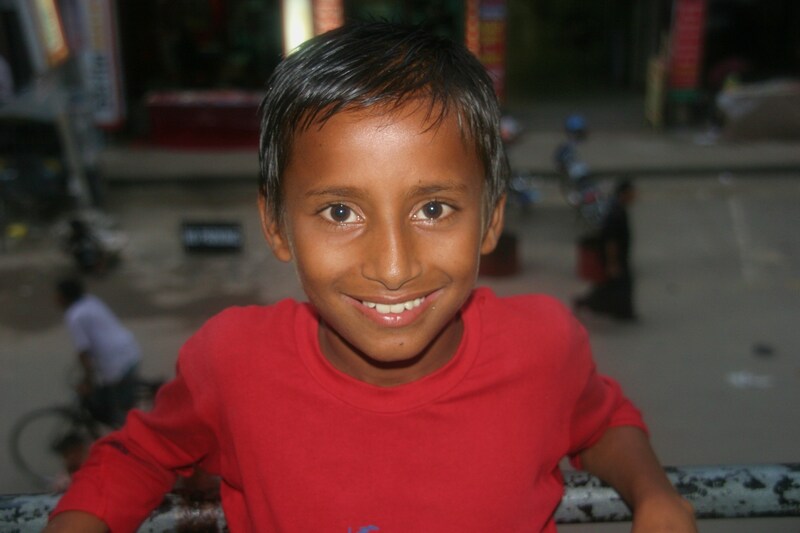 Street hawker Sohel has spent the last six years working at the Gulshan 2 intersection and he may very well be Dhaka’s youngest entrepreneur – though it’s impossible to verify, because he isn’t sure whether he is eight, nine or ten years old. Sohel started out by begging for alms, until one day a man stuffed a bunch of stickers in his hand and said, “Sell these.” Sohel said that it is “nicer” to have something to sell rather than to beg. He buys Tk 200 of stickers from a nearby shop and makes a profit of around Tk 150 per day. He usually keeps between Tk 10 and Tk 20 for himself, and gives the rest to his family, who live in an area close to the American embassy. He arrives at the intersection at around 9am and leaves about 10 hours later. Recently, when another street hawker was beaten to a bloody pulp by gang members, the street kids decided to go to the police for assistance. Although street hawking is illegal in Bangladesh, Sohel said that the police were very reassuring – and that they came to the intersection to give the gang members a taste of their own medicine. “The gangsters won’t be back this lifetime,” Sohel assured me, but one wonders how he can be sure. Sohel has been harassed by gang members ever since he started working. While sitting on the balcony of a café during the interview, Sohel’s raggedy friends try to distract him from the street below. “Ali Baba! !” they cry out, while throwing coconut husks across the road and being chased by shopkeepers wielding cane sticks. It almost seems a performance for our benefit. “They call me ‘Ali Baba’ because it means ‘thief’, but I don’t know why,” said Sohel, shaking his head. Perhaps Sohel’s friends consider him their leader; or perhaps it is a term of endearment, as it is in its literary sense. That, however, might be unlikely – none of Sohel’s friends have been inside a classroom. Sohel said that he went to a school in his village, which is about 10 kilometres from Comilla. He hasn’t been back inside a classroom since his family moved to Dhaka, but he said that a woman comes to his house and teaches him the alphabet, which he can write in both Bangla and English. However that seems to be the extent of his learning. He said, “If I stayed in the village, I would be studying. I could be like you if I had stayed there.” He’s obviously a smart kid, and charismatic too – and unlike some of the other street kids, Sohel said he’s not interested in sniffing glue or taking amphetamines. “I just come here and sell stuff, I don’t want to sniff anything,” he said. Sohel will need to save a lot of money and keep his wits about him if he is to achieve his dream to open a shop of his own in Gulshan. “I want a grocery store or something,” he said, before adding, “Something from which I can feed my family.” This is a dream yet unfulfilled by Sohel’s father, who works as a janitor in Banani. Despite the fact that two out of the four children are also working, Sohel’s family gets by on just one meal a day. When the interview finished, Sohel politely explained that he had lost some earnings by being away from the street. He refused to specify how much I ought to give him, preferring instead to leave it up to me. I compensated him fairly generously, having been impressed by his patience in answering so many questions, as well as being staggered that he refused to order a single drink or snack – despite my protests that he could order anything he wanted. “I’ll buy some food for my family with this money,” he said with his Cheshire cat grin. I’m sure he did. thank you so much for this post. 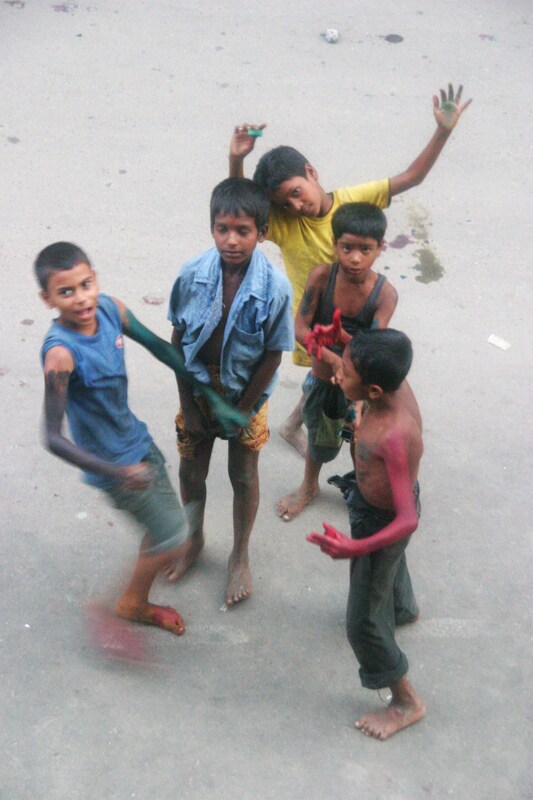 i just arrived in dhaka and at the gulshan-2 circle, i saw the children with their stickers. i wasn’t interested in buying stickers, so i bought food for them. but later i had doubts if i made the right choice (because i read about mafia groups and i don’t want to support that). but your post was a great chance to find out more about the children (i don’t speak bengali, so i couldn’t ask them..). thank you.